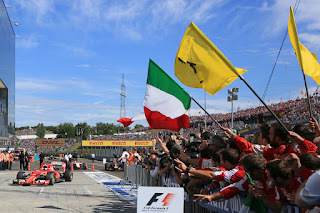 Additionally straight after the hiatus we have two races in which Ferrari should be strong, as the Italian team tends to put a relativity large amount of resource into its low downforce spec so to get a good result at home at Monza and this serves it well in Spa also. 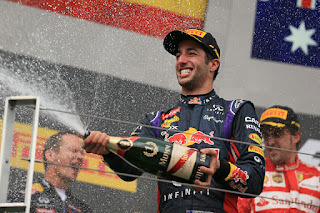 This wasn't the case last year for Ricciardo's Renault-powered Red Bull (although Ricciardo of course managed to win at Spa too thanks in part to more Merc self-compromising). But the title odds remain stacked against Vettel due not only to the points gap (close to two whole wins with nine rounds remaining) but the pace one too. Which really is what this game comes down to; what keep engineers awake at night. I recall some sage or other being quoted to this effect a few years back: it's not about wins, it's not even about points. It's about lap times. Are you quickest or are you not? If you're not you're in trouble. And Mercedes is quickest. Let's not forget either that prior to the Hungaroring round the prevailing wind appeared to be actually that Ferrari was slipping away from the pace. Upgrades such as a big one brought to Spain didn't really work. Perhaps even it was in the beginning to step into one of its time-honoured crises. We all know that in F1 those that are confident like to talk their chances down in public. But the fickleness of this game maybe also explains Ferrari boss Maurizio Arrivabene's pouring of cold water on the whole idea of a title chase down post-Hungary. "We are in a good way, therefore we keep our feet on the ground and head down" he said after the team's triumph. "Mercedes is strong everywhere" he cautioned. "We expect to have good races, bad races. The direction that we took is good. We have nine races to go. 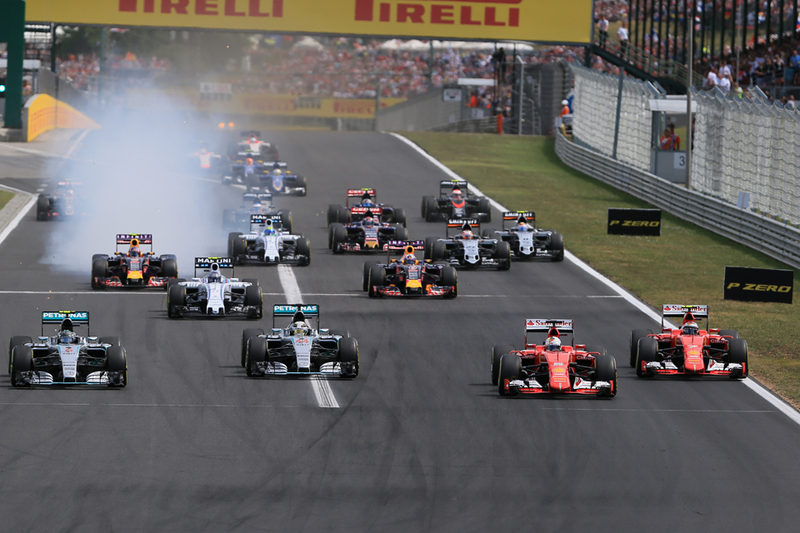 We will have races like this one, and others maybe like Silverstone and Spain." Realistically to prevail Seb needs a lot to go in his favour. An upturn in Ferrari competitiveness. Or Mercedes repeatedly blasting its own feet off. Or both. 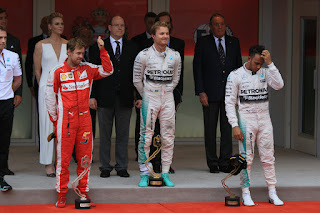 There are those two historical precedents of sorts mentioned, though it should not be forgotten that in Kimi's case he was the quickest package in the latter part of the year and Prost in 1986 never ceded all that much ground in the points table (the furthest he was behind that season was 11 points, with nine for a win). Plus it's easy to disregard that the major reason we tend to remember such extreme cases is precisely because they are unusual. Yes I hear you cry the Ferraris apparently had the legs of the Mercedes in Hungary's race (though not in qualifying, but more of that later). True, though perhaps Nico Rosberg not keeping up in the red cars' wake was peculiar. He appeared unhappy with his car's handling for most of the weekend and also governed by odd conservatism (more of that later too). He later admitted also that he simply dialled in too much understeer in trying to protect his rear tyres. Then we have Lewis, who although in a self-confessed "bad day at the office" drove like a hooligan on occasion in Hungary - ending up in tenth after less than a lap is far from good news at the sinewy track - he not only won pole by a street but in a brief and about the only spell of last Sunday when he had free air he took the thick end of a second a lap out of Seb. You can't rely either on Lewis being as bad as he was in Hungary's race every time, though there is a little additional food for doubt for him that his slight scrappiness can in fact be traced back to two rounds ago in Austria when he binned it on his final qualifying run (though he got away with it) then picked up a penalty in the race for wandering over the pit exit line. 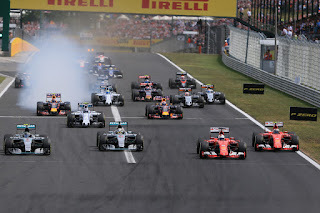 Then in Britain's race in something of a portent to his opening lap in the Hungaroring he left the track trying to pass Felipe Massa as soon as safety car went in with what appeared undue haste (though again broadly speaking he got away with it). But Mercedes has a couple of problems. One is its starts which have been poor in the last two races - and without much explanation forthcoming. Whatever is the explanation they've sown the seeds of Merc defeat as team boss Toto Wolff noted indeed in Hungary's aftermath. They've made the team go from untouchable to beatable within metres of the red lights going out. Williams in Silverstone could have won with ruthless strategy and no rain. Ferrari did win in Hungary. In Spa a change to the rules on starts, with less in the way of trick procedures, awaits. Some reckon this gives the team yet more cause for worry but perhaps in a perverse sense a trip to base camp on this for everyone is exactly what Mercedes needs. Gary Anderson on the other hand has a theory which isn't encouraging for the silver lot. "As we know there are a lot of changes on startline strategy coming for Spa and this was being discussed and detailed before the British Grand Prix" he said in Autosport. "I wonder if it is just a coincidence that Mercedes' starts have dropped off since then? Perhaps it decided to back things off a bit while the FIA was snooping around". Spa indeed will give us more clues on that one. Such had been the team's advantage we might have assumed that even after losing the lead the silver cars would sweep back into the lead pronto, but in neither race has it happened. It hasn't helped that we've been on two tracks with lots of long corners that are difficult to follow cars closely through. It hasn't helped either that following closely generally has been more difficult this year, a consequence it seems of the aero of the front of the cars. That the Pirellis are harder and offer less of a wildcard element is a factor also. That being out front is advantageous generally is part of it of course. That as seen in Hungary too the Ferrari is better in quali than the race contributes too. But it might not be just about these. Which brings us to Mercedes's other main problem. Anderson after the Hungary round summed up the lingering feelings of a few: "To me Mercedes has everything and it's a winning team, but it is not yet a team that knows how to win when things start to go wrong." In fairness the team doesn't get a great deal of practice at that. But then again it's not like it's a new problem. Mercedes has got strategy wrong before. We have seen a good few times that the team's decision-making can apparently go to pieces, particularly when placed under pressure. One thinks quintessentially of Monaco earlier this year when it managed to pit Hamilton and thus remove him from a near-untouchable position out front as it was spooked into defending him against thin air. One thinks of Seb's other win this campaign in Malaysia when Merc had something of a full house - signposting its intended race strategy in qualifying, not splitting its strategy ticket in an early safety car period (apparently as it didn't want to offend either driver) and then when it fell upon a winning strategy partway through the race discovering it didn't have the tyres available to see it through. Adding to the parallels one thinks of the Hungary race last year when it got too clever by half with team orders, somehow thinking Lewis would be minded to trash his own chances in order to aid his team mate and chief title rival. As James Allen outlined in his as-ever excellent strategy analysis of the race: "A smarter and more aggressive move for the team would have been to do another lap, as Ferrari was doing and talk through the tactics with the pit wall, giving them the time they need to switch a set of softs into the rack. There were still 28 laps to go, which are too many for a set of soft tyres, but clearly the debris was extensive and therefore the Race Director was likely to deploy a Safety Car, which would take several laps to clear." Perhaps too though all were swayed by Nico's curious cautious thinking. Earlier he'd expressed an odd attachment to the medium tyre on the team radio, when he wasn't actually lapping any quicker than Danny Ric was on them. Allen thought this told us something, that he was inspired simply by 'covering' his closing team mate and had disregarded any prospect of hunting down the Ferraris ahead. Was Mercedes swayed by Nico Rosberg's caution? "This showed a rather disappointing lack of ambition on Rosberg's part" said Allen. 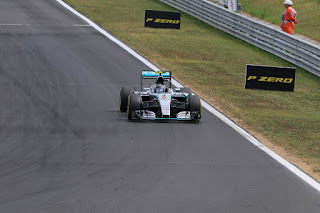 "It is not in Mercedes' interests to have one car slowing the other one down, which is what Rosberg was seeking to do. Their interest is in winning the race. The pit wall was asking him to close up to Raikkonen, so that he could take advantage of the soft tyres in the final stint and attack. "Also it had echoes of the disastrous late tyre decision Hamilton made in Monaco, which was also aimed at trying to get the team to do something which was in his interests rather than the team's, in order to get one over his team mate." Anderson concurred: "Both [Mercedes] drivers are far too selfish and self-centred, and it needs to be explained to them that the team comes first." Perhaps though the causal arrows point the other way and Nico has simply been contaminated by the general air of confusion down Merc way. Whatever is the case though just like 12 months ago we head into the second half of this year with an unlikely, but still tangible, possibility of the haughty Mercedes being toppled. But just like 12 months ago you feel also that the team never should have allowed even close to that.